I was on RT this morning (evening, if you're in Moscow), commenting on Hillary Clinton's Balkans trip. She won't say or do anything new, only deliver the same old demands. Centralize Bosnia, dismember Serbia, recognize the "Independent State of Kosovo," and maybe some day the Balkans "savages" might earn the right to clean NATO boots and fill NATO body bags. Or, if they really behave, wait tables in the EU. In the minds of the quisling government in Serbia, its lapdog media, and the Western press (used over the past two decades to demonizing the Serbs without a second thought), what happened on Sunday were "anti-gay riots" by "right-wing extremists." Ten years ago, the "Democratic Opposition of Serbia" came to power in the October 5 coup. Funded by NED and the CIA, it was the trial run for "color revolutions" later organized elsewhere. 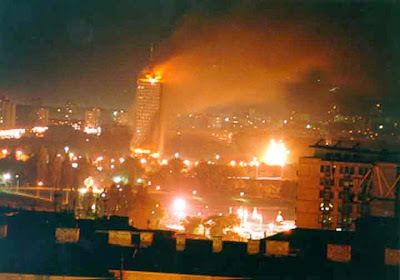 Back then, these very same "democrats" eagerly employed these very same "hooligans" when it came to storming the state TV, the party offices of President Milosevic and his wife, and the national Parliament, which was set on fire. But, you see, violence is "democratic" when it democratically serves the interests of democratic democrats. Employed against them, why, it's fascism! Sunday's riots had very little to do with the "gay pride" parade. The parade itself was nothing but the proverbial straw that broke the camel's back. The camel, in this instance, is the Serbian people, who were "rewarded" for their "democracy" with a decade of systematic pillaging, corruption and destruction of everything worth anything, and a never-ending series of humiliations. The government has long since stopped pretending it had any democratic legitimacy, demonstrating in no uncertain terms that it held to Mao maxim that "power came from the barrel of the gun" - or in this case, the police baton. It envisioned the "Pride parade" as a show of dominance over the general populace, and a way to impress its masters in Brussels and Washington. At a time when almost half of Serbia lives in abject poverty, and rummaging through rubbish has become a major branch of agriculture, the government set aside twelve million dinars (about $160,000) to organize the "Pride parade." This was not about the homosexuals. There were barely a thousand people who "marched" on Sunday. Among them were government officials and foreign ambassadors. The rest were professional homosexuals, "gay activists," people who have reduced their entire lives down to their "queerness" and the need to rub it into everyone else's face, so they can get pity and special treatment for being "victims of oppression" when people who aren't into face-rubbing react predictably. They didn't want rights, they wanted attention. The parade was first and foremost a political event, a message from the government that its will is the law, that some people are going to be "equaler" than others, that the opinion of ordinary folks isn't worth a dime. On Saturday, October 9, some ten thousand people rallied in downtown Belgrade, and peacefully marched through the city, singing, walking with their children, sending a message to the government that this was, in fact, Serbia. The mainstream media either completely ignored this event or reported that "several hundred citizens" rallied "against the gays." Nor did the Western press make a peep. Sunday, it was a different kind of Serbs on the streets. The young, the angry, the people with nothing left to lose. Yes, some of them hate homosexuals. Yes, some of them may fancy "far right" ideas. And yes, they let their fists and rocks and sticks do both the thinking and the talking. But their rage was directed principally against the government. Just look at their targets: a bus with the logo of B92, a hated propaganda network; the RTS building, the state TV that also broadcasts government propaganda; the HQ of the ruling Democratic party. According to the police, they also attacked "a mosque and some foreign embassies." What do all these things have in common? They are all symbols of the quisling government and the foreign powers that have de facto occupied Serbia. (Why the mosque? Because a militant Islamic cleric has been fanning the flames of hatred and war in southwestern Serbia for the past six months; except the rioters were so incensed, they didn't stop to make a difference between his followers and those of the moderate Mufti of Belgrade, whose mosque they - allegedly - attacked). It was the government that cynically manipulated and abused the homosexuals, setting them up for violence and bloodshed so it could assert power over the "hooligans" that responded. Now we're treated to proclamations by Brussels that the Belgrade regime is "protecting human rights." What rights?! Sunday's events shattered what little was left of this government's legitimacy. It didn't have much to begin with, composed of two coalitions that ran against each other in 2008 (no one, not a soul, actually voted for the current regime). As of Sunday, it has none. It rules not by the will of the people, but by the will of the Empire. While it lasts. 10-10-10 may well turn out to be a turning point in modern Serbian history, a day when open revolt against the quislings finally began. Yes, it is ironic that it would start over a "pride parade" as opposed to countless acts of robbery and treason the regime is responsible for. But history tells of many major upheavals that started with the seemingly unlikeliest of events. For the past decade, and especially the past two years, Serbia has been in the grip of a regime so abominable, that any attempt to restore normalcy appears extreme. It was only a matter of time before some people concluded that extremism in defense of virtue was no vice.